Okino has one of the most extensively developed plug-in development systems and APIs. It was begun in 1988 and had grown to over 700 pages of documetation as early as 1991; all major development and extensions continue to be added to this API as it forms the core Okino software technology. The API and Okino toolkit predates most other data conversion packages on the market by at least 5 to 10 years, and it grew and expanded along with the parallel developments for such popular 3D animation packages as 3ds Max, Maya, Cinema-4D and LightWave (all of which had their origins in the mid to late 1980's), so it inherits from the best of 3D technology for data conversion and 3D development. Okino's plug-in development program allows third party developers and vendors to create new importers and exporters for PolyTrans, NuGraf, and all the special plug-in versions (PolyTrans-for-Maya, PolyTrans-for-3dsMax, etc). System-level plug-ins can also be created to extend the main user interface, such as plug-in renderers, modelers, search engines, using a secondary layered "user interface" API (similar in how 3ds Max exposes its user interface functions). The following lists of plug-in modules have been made available from third party vendors, either for free or for purchase. First, you need to install either a commercial version of Okino's stand-alone PolyTrans or NuGraf software on your machine, or the demo versions. Second, you need to download the plug-in module(s) from the links below and install them into the "vcplugin64" directory, which is contained in the home PolyTrans or NuGraf directory. Some plug-ins will have their own .exe installer, while others will be distributed in a ZIP file. If you receive a ZIP file then it should ideally contain 3 files with an extension of .dll, .rti and .hlp, such as imp_3ds.dll, imp_3ds.rti and imp_3ds.hlp. Do not edit or modify these files. Once the files have been installed into the "vcplugin64" directory, restart PolyTrans, NuGraf, PolyTrans-for-Maya, PolyTrans-for-3dsMax, etc. The new plug-in should appear within the Okino product. If you are a third party developer who wishes to add more 3D file format capabilities to your product then this can easily be done (without additional OEM licensing from the same toolkit manufacturers we license from) by reselling and bundling PolyTrans or NuGraf along with your product. A tighter integration can be made by writing a custom importer or exporter for PolyTrans that accommodates your native file format. Email support@okino.com for more information. Okino's "integration SDK" allows third party programs to gain direct user access to the PolyTrans conversion technology within their own products. Module(s) are inserted into these third party programs to enable such integrations. The 'Engineering Bundle' for Cinema-4D, by MAXON Computer. Plug-In Type: Integration modules between Maxon's Cinema-4D and Okino's PolyTrans. Please also refer to Okino's CINEMA-4D solutions page. The CINEMA 4D Visualize and Studio editions use the Okino PolyTrans import filters to import numerous CAD file formats into Cinema-4D. If Cinema-4D and your licensed copy of PolyTrans are placed on the same computer then all of the Okino licensed converters will automatically show up inside of the Cinema-4D user interface. Note: Maxon's 'Engineering Bundle' system has now been superceded with Okino's newer PolyTrans-for-CINEMA-4D conversion system. PolyTrans Integration into 'Quest-3D', by ACT-3D. Okino and Act-3D have partnered to integrate the PolyTrans 3D data conversion software into the Quest3D product. If Quest3D and your licensed copy of PolyTrans are placed on the same computer then all of the Okino licensed converters will automatically show up inside of the Quest3D user interface. The Quest3D exporter module will first have to be placed into the PolyTrans "vcplugin64" directory. These plug-in modules will allow the contents of the current scene in the Okino software to be exported to external 3D file formats. Exporter Module for the OSG/IVE File Format (Open Scene Graph). The OSG/IVE file exporter was developed by Iowa State University with the intended purpose of connecting Okino's large array of 3D file importers to the OSG-based VE-Suite program. Please contact support@okino.com and we will forward you the installer on behalf of Iowa State University. Visual Components Exporter For the 3DCreate File Format. Price: Please contact the developer. Product Brochure: Please click here. Visual Components is a world leading 3D simulation and visualization specialist offering machine builders, system integrators and manufacturers a simple and quick way to build and simulate process solutions. The Visual Components PolyTrans Exporter is an Add-in module to Okino's software which allows the export of its supported CAD, DCC and VisSim file formats into the 3DCreate simulation software. With the help of Okino's polygon reduction tools it is easy to generate light weight and visually accurate 3D simulation models. These models can be used by engineers to analyse system performance or strenghten sales proposals. Exporter Module for the Quest-3D File Format, by ACT-3D. Okino and Act-3D have partnered to integrate the PolyTrans 3D data conversion software into the Quest3D product. A component of this integration is the custom Quest-3D file format exporter for Okino PolyTrans. '4DC' Exporter For Virtools .nmo 3D File Format. The '4DC Exporter' is an add-in module to Okino software which allows all of its supported CAD, DCC and VisSim file formats to be repurposed into the Virtools .nmo file format. IRIT Modeler File Exporter Module, by Gershon Eber. Price: Free. For use with the infamous and free IRIT modeling environment. Download Location: Near the end of the IRIT home page, or download directly from here. IRIT is a solid modeling environment that allows one to model basic, primitive based, models using Boolean operations as well as freeform surface's based models. The system is designed for simplicity and is geared toward research. Beyond its strong support for Bezier and Bspline curves and (trimmed) surfaces, IRIT has several unique features such as strong symbolic computation, support of trivariate spline volumes, multivariate spline functions and triangular patches. A rich set of computational geometry tools for freeform curves and surface is offered, such as offsets, bisectors, convex hulls, diameters, kernels, and distance measures. These plug-in modules will allow 3D geometry and scene data to be imported from external files on disk or allow the contents of the current scene in the Okino software to be exported to external 3D file formats. Availabity: The plug-ins for Okino software are obtained directly from CADMATIC. 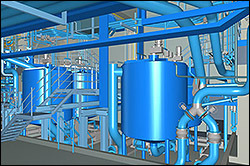 CADMATIC Oy is a leading developer and supplier of 3D software for the plant and ship building industries. The company headquarters are situated in Turku, Finland from where the company provides design solutions to its large customer base worldwide. Okino and CADMATIC have collaborated for many years to create a fluid 3D conversion pipeline from Okino's CAD importers into CADMATIC 3D Plant software. This is achieved through a custom 3D export converter module for Okino software which creates "3DP" files. Such files can then be loaded into CADMATIC's 3D plant design software. At this time CADMATIC may also be offering a 3DP importer module for Okino software (please check with CADMATIC Oy for current availability). This custom solution allows CADMATIC users to source from all primary MCAD and CAD programs, resulting in highly optimized, clean and robust 3DP files. Commonly requested source MCAD programs include SolidWorks, ProE/Creo, STEP/IGES/Parsolid solids, DWF-3D, (for the technically best AutoCAD, NavisWorks, Revit, Inventor conversions) DXF/DWG, JT and basically all other top named MCAD programs. 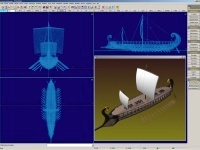 The 3DP Exporter plug-in for Okino software is developed and maintained by CADMATIC. Please contact them directly to obtain the 3DP installer. If you wish to convert from the CADMATIC 3D Plant software into other BREP solids modelling programs (such as SolidWorks, UGS NX, Siemens Team Center, ProE/Creo CATIA, etc.) then please contact CADMATIC directly for their speciality methods and processes. Such processes are not provided by Okino software as its requires special processing of data from the 3D Plant software. As examples, CADMATIC 3D Plant can export JT "solids-based" files for UGS NX and Siemens Team Center, while the use of a local copy of AutoCAD allows CADMATIC 3D Plant datasets to be converted into "solids" for Autodesk Inventor and other programs. Pytha 3D Importer/Exporter Module, by CATS Germany. The export converter create binary Pyo-format. The user may choose whether only the selected or all elements are converted to PYTHA 3D-parts. A PYTHA-part is generated from the leaves of the structure or from a user defined level. The import converter reads the binary Pyo-format to generate 3D-geometry within PolyTrans. PYTHA is registered trademark of PYTHAlab GmbH Germany. Pytha 3D-CAD is a fully integrated program with Modelling, Raytracing & Radiolab, offering simple to use design, presentation and manufacturing capabilities. Ideal for shop fitters, furniture manufacturers, exhibition and Show Design. 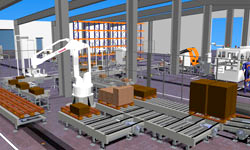 CATS GmbH (www.cats-cad.de) is a German service provider and reseller of the PYTHA-software. We have programmed the interface to give PYTHA-users a chance to have access to non-PYTHA 3D-geometry and to exchange their own 3D-geometry.